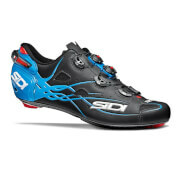 The Wire Carbon Air Vernice Cycling Shoes from Sidi deliver ultimate performance without compromising comfort, and is versatile for both road and MTB cleats. Tecno-3 Push system, an adjustable heel retention device and a soft instep fastening device will keep feet fully supported and snug, perfect for riders who want efficient power transfer with the optimum fit. - R.K.
Soft Instep 3 System: This system is a wide, anatomically curved strap combined with a soft, thermo-formed EVA pad that distributes pressure evenly over the instep area. The Soft Instep Closure System is adjustable from both sides, to perfectly centre the EVA pad over a high or low instep. The system eliminates the need for the High Instep Extender. The Soft Instep Closure System is replaceable. 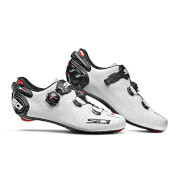 Tecno-3 Push System: Sidi’s Tecno-3 Push System dials in the fit along the entire length of the shoe, adapting the upper to the shape of the foot for a customised fit. Sidi’s famously reliable and replaceable closures are improved by an all new proprietary Sidi Wire material that is completely non-binding for intuitive and effortless on-the-fly adjustments. Like most Sidi small parts, the Tecno-3 Push buckle is serviceable and replaceable. It can be adjusted while riding, thanks to an innovative button which can be pushed to lift the buckle and facilitate the adjustment. Adjustable Heel Retention Device: The adjustable heel retention device reinforces the top of the heel cup and improves the fit by closing the back of the shoe securely around the rider’s heel. The heel retention device tightens the top of the heel cup so that the heel doesn’t slide out during steep climbs or sprints. Each side of the heel can be adjusted independently, for a perfect fit. For a custom adjustment turn the screw towards the + sign to tighten the heel retention device and towards the – sign to open it. Lightweight, easy to use, and replaceable. Sidi Heel Cup: The reinforced heel keeps the foot in a optimal position and avoids the shoe being deformed by extreme performance or prolonged pressure. 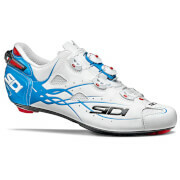 For walkability, Sidi cycling shoes include a replaceable polyurethane heel pad. Vent Carbon Sole: The Vent Carbon Sole features a light and replaceable heelpad to improve walkability in polyurethane and a replaceable integrated toe pad/vent cover. The key benefits of the Vent Carbon Sole are not only superior power transfer, because of its light weight and stiffness, but also warm weather comfort. The Vent Carbon Sole is designed with an integrated vent and air channels for heat dissipation and air flow. The vent can be opened or closed for 4-season comfort. The Vent Carbon Sole is handmade exclusively of carbon fibre in a weave pattern oriented at opposing angles that maximise stiffness while allowing for a small degree of controlled flex in the toe area. This carefully designed flex biomechanically relieves stress on the plantar tendon and helps promote circulation. The Vent Carbon Sole features a standard 3-hole drilling pattern, printed 10 mm lateral and fore/aft cleat alignment scale as well as the Look Memory Eyelet for easy cleat alignment and replacement. For triathlon, the vent also serves as a water drain, dramatically improving foot comfort after a wet transition. Please Note: All buckles and mechanisms are replaceable. Upper: Vented Microfibre Performa Tech Pro. Sole: Carbon.